(NaturalNews) "We may need to seek them out and destroy them where they live," wrote a Merck & Co. employee who was actively plotting to murder or discredit doctors who had voiced concerns regarding the adverse health effects of an anti-inflammatory drug called Vioxx. Launched in 1999, Vioxx was extremely popular (with more than 80 million users worldwide), as its makers heralded the drug as being the answer to inflammation, minus the nausea that often follows with anti-inflammatory medication. It was later discovered that the New Jersey-based Merck & Co. was knowingly selling a drug that frequently caused heart attacks and strokes in its unsuspecting victims. A study revealed that Vioxx actually doubled the risk of heart attacks and strokes, prompting the company to voluntary withdraw the drug from the market in 2004. Prior to the drug being pulled from the market, several Merck & Co. staff exchanged emails in which they discussed a "hit list" they drafted of doctors whom they believed needed to be "neutralised" or "discredited" due to their criticism of Vioxx. The emails surfaced in court after 58-year-old Graeme Peterson claimed the drug caused him to have a heart attack in 2003 after taking the medication for three years to treat his back pain and arthritis. Merck & Co. and its Australian subsidiary, Merck Sharpe & Dohme, were sued for damages by more than 1,000 Australians (and many others in the US), who claimed that they suffered heart attacks and strokes at the hands of Vioxx. The court ruled in Peterson's favor, allotting him just under $300,000 in compensation; however, the ruling was reversed in 2010 by an appeal panel in Federal Court in Melbourne. The court said it wasn't proven that Vioxx caused Peterson's heart attack, despite accusations that the American pharmaceutical company misconstrued Vioxx's health risks in medical literature, advertisements and statements to doctors by sales representatives. It seems that Merck & Co. was never held accountable for the threats it made against doctors, researchers and academics, in which at least eight clinical investigators were harassed and intimidated, giving the drug company no reason to stop such intimidation tactics. Those same tactics are in play to this day and are carried out against anyone who stands in the way of Big Pharma's profits. One of the most recent, and particularly disturbing, examples of this involves a woman named Brandy Vaughan, an ex-employee of Merck & Co. who used to rep Vioxx. Vaughan worked for Merck & Co. from 2001 to 2003, but resigned after learning that her employer falsified safety data on Vioxx, covering up the fact that it doubled the risk of heart attacks and stroke. After living overseas for quite some time, Vaughan returned back to the US with her six-month-old son and took him to a wellness visit in California. Knowing little about vaccines, but enough to know not to trust pharmaceutical companies, she asked the doctor, who was pushing for her son to be vaccinated, to see the inserts. This angered him. He accused her of not trusting him before storming out of their visit, after which the nurse made sure to let them know that they weren't welcome back. The experience sent Vaughan down the rabbit hole of vaccine research, which unveiled a multitude of concerning information leading her to decide to not vaccinate her son. 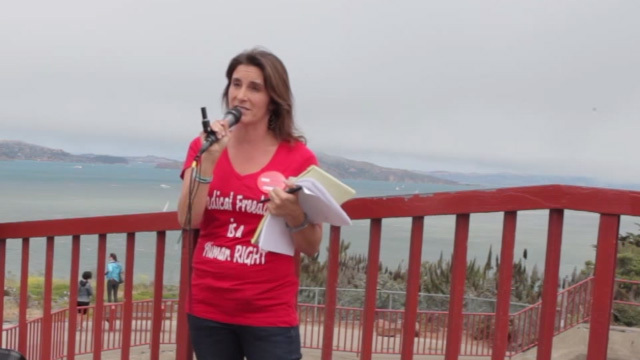 After learning about the flawed data on vaccines, the toxins they contain and the total lack of safety testing, Vaughan turned to activism as she began to spread awareness about the risks of vaccines, focusing particularly on speaking out against California's SB277 forced vaccination law. "If there's a risk, there has to be a choice," says Vaughan, who at the time could not predict the repercussions she would face for the influence she was having. After attending a rally against SB277 at the capitol, Vaughan returned home to a startling discovery when she found her hide-a-key laying on her front door step – with the door left open – which had been hidden in the bushes a year earlier after she purchased her home. Six months ago, she searched for the key, but it wasn't where she had left it. Whoever did this, their message was clear – we're watching you and we have access to your home. Unnerved by the experience, Vaughan installed a $3,000 security system. The second incident occurred after Vaughan exposed the names of who she believed to be the "controlled opposition" in the fight against SB277 on Facebook. She called the police and spoke to a security expert with a history of carrying out intimidation tactics for corporations. Her home was likely "tapped" during the break in, she was told, meaning that everything she said and did was probably being listened to and even watched. Below is a powerful 12-minute video detailing the intimation tactics being orchestrated against Vaughan. I encourage you all to watch as it will send chills down your spine and open your eyes to the extreme lengths corporations are willing to go to protect their profits. Natural News felt that it was very important to inform the public about what's happening to Vaughan. By exposing her story, we can provide her with more protection. Moving forward with absolute bravery, Vaughan continues her activism through the non-profit she founded, the Council for Vaccine Safety, which seeks to "increase public awareness and education on the risk of vaccines while advocating for safer vaccines." You can check out some of her powerful speeches, as well as upcoming speaking events on her Facebook page. With the discovery of at least nine dead or missing Florida-based naturopathic doctors , the passing of SB277 and the harassment toward Miss Vaughan, it's clear that there's a war against natural health freedom and anyone who seeks to expose the corruption so deeply rooted in the medical establishment. Based on the recent chain of events, it's become clear that the Black Ops branch of Big Pharma is real, and its hired assassins will go to great lengths, including murder, to silence those who stand in their way. Natural News' Mike Adams is no stranger to threats and intimidation tactics, as he's been on the receiving end of many, which is why he never leaves home unarmed. "A surprising number of people in the natural health community have come to learn, by necessity, that they need to carry concealed firearms as a practical matter of personal protection," says Mike. "In an age where the medical industry routinely murders babies to harvest their organs, it should be no surprise to learn that global pharmaceutical companies also hire terrorists and Black Ops personnel to try to silence anyone who interferes with their profits." Dr. Teresa Sievers, a Florida-based naturopath who is now deceased, left conventional medicine to open her own practice, a holistic center that focuses on the mind, body and spirit connection. On June 29, Sievers was found dead in her Bonita Springs home. She was brutally murdered, and with a hammer, according to investigators. While Lee County Police Department's Sheriff Mike Scott says the case "has the most evidence he's ever seen," no arrests have been made. While we still don't know who or why anyone would commit such a heinous act against an innocent woman – who not only was saving lives but was a wife and mother of two young daughters – the timing and circumstances of her death eerily coincide with other area doctors who shared a similar focus and fate. Among those found dead are Dr. James Jeffrey Bradstreet, Dr. Nicholas Gonzalez, Dr. Bruce Hedendal, Dr. Baron Holt and Dr. Lisa Riley – all of whom practiced alternative medicine. Learn more about what Bradstreet and Gonzales were studying here, here and here. Dr. Patrick J. Fitzpatrick, a retired ophthalmologist from North Dakota and Dr. Jeffrey Whiteside, a pulmonologist from Wisconsin, both went missing in early July. More than a month has passed, and there's still no information about their whereabouts. It appears that both doctors practiced Western medicine, so it's unclear if they're connected to the Florida naturopaths. Three other doctors went missing on June 19 in Guerrero, Mexico, the same area in which 43 student teachers went missing in September 2014. While authorities say they've identified the bodies, as well as found the vehicle they were riding in riddled with bullet holes, at least two of the victims' families said the bodies they were asked to identify at the morgue was not their loved one. The family is accusing Guerrero's attorney general of "manipulating" the case and pretending it's solved in order to shelf it, along with thousands of other unsolved murders in the region.